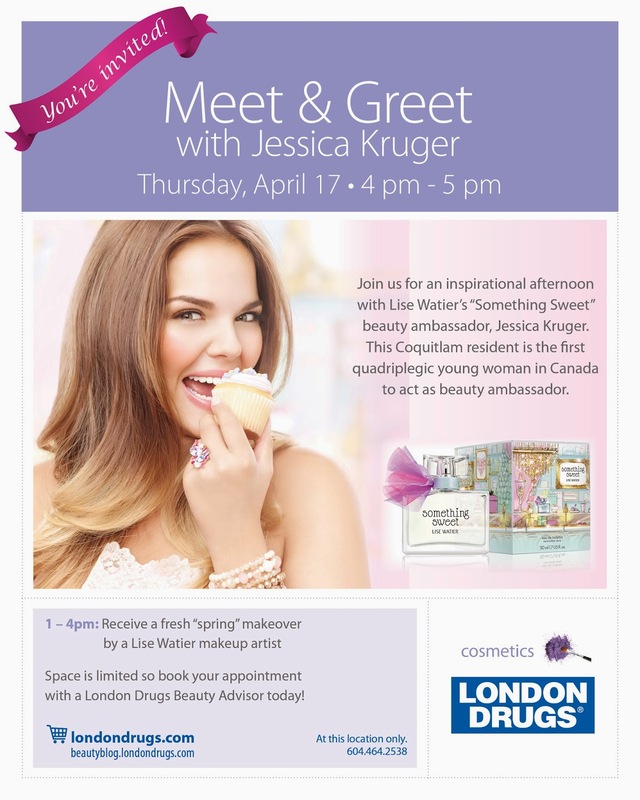 This Thursday, London Drugs and Lise Watier are hosting a special makeover and meet & greet event with Lise Watier Something Sweet spokeswoman, Jessica Kruger. Something Sweet is the name of Lise Watier's fragrance for young, positive women and Kruger totally embodies the brand. This special 21-year-old from Coquitlam has shown herself to be a role model already at her young age. When she was 15, Jessica fainted and fell from a ladder while painting a house. She became paralyzed as a result of cracking four vertebrae in her neck. However, Jessica has never let her disability affect her life. She is the youngest female rugby player in Canada and she has become an inspirational speaker on behalf of Worksafe BC and the Rick Hansen Foundation. Whether you go simply for the makeup or just to feel inspired by Jessica's words, this is an event you don't want to miss!